We have many services and educational material available for anyone who wants to be GREAT when they stand in front of a group. GREAT SPEAKING is the Electronic Magazine for Presentations Skills Tips, Speaking 4 Money, Speaking Business Referrals, Speaker Marketing, Speaker Humor, and other Public Speaking related Features. Click here for your FREE Subscription. 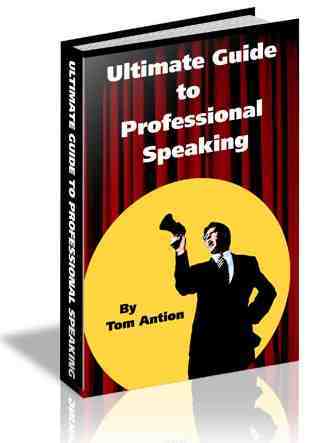 Tom gives you a virtual Ph.D in Speaking. The most up to date speaker performance and marketing information. Learn what you need to know about websites, associate programs, website sales process, email marketing, ebooks and much more. From Tom's Best Selling Advanced Presentation Skills Book Wake 'em Up Business Presentations now in its second printing. Tom WILL NOT accept just anyone into this program. If you think you are already a great speaker, DON'T CALL! If you are arrogant, and uncoachable, DON'T CALL! If you are willing to do the work necessary to become a great speaker, THEN PLEASE CALL! Tom will go out of his way to help you. If you have a speaking related website and want to trade links with this site, send an E mail to linktrade@antion.com for automated instructions. To see examples of our link partners click here. Tom will give you tons of ideas to add to your presentations. Top quality advanced speaker training materials. --Even if you are a beginner, why not learn the techniques needed to be great in today's tough audience environment? Make $5500.00 per speech and get your instructions on how to do it in one cost and time effective package. FREE Categorized humor for speakers and we're adding more all the time. Get an objective and unbiased critique of your performance by one of the top speaker coaches in the country. PLUS recommendations for areas of needed improvement. WARNING: This is not for the faint at heart. If you want to get better you must recognize that no matter how good and/or successful you are, you probably have presentation weaknesses.